Da Igor Fjodorowitsch Strawinski (russ. Игорь Фёдорович Стравинский, frz. Transkription Igor Stravinski, engl. Transkription Igor Stravinsky; * 5. Junijul./ 17. Junigreg. z Oranienbaam [heit: Lomonossow], Russland; † 6. Aprui 1971 in da Stod Nei York) wor a russisch-franzesisch-amerikanischa Komponist. Des Weak vom Strawinski hod a grousse stuilistische Vuifoit. Sei Schoffn wead in drei Periodn eiteit: russische, neoklassizistische und serielle (Neiche Musi). Da Strawinski hod an guadn Gschäftssinn ghobt. Ea is aa ois Pianist und Dirigent aftredn, und vui vo seine Kompositiona worn Aftrogsorbadn. Des is a Listn vo de Kompositiona vom Igor Stravinsky. "Ma tu, cagion di quella"
↑ 1,0 1,1 1,2 "1962 Grammy Awards". Infoplease. 5 March 2012. http://www.infoplease.com/ipa/A0150544.html. Retrieved on 15 March 2012. Berry, David Carson. 2008. "The Roles of Invariance and Analogy in the Linear Design of Stravinsky's 'Musick to Heare.'" Gamut 1/1. Greene, David Mason. 1985. Biographical Encyclopaedia of Composers. New York: Doubleday. Griffiths, Paul, Igor Stravinsky, Robert Craft, and Gabriel Josipovici. 1982. Igor Stravinsky: the Rake's Progress. Cambridge Opera Handbooks. Cambridge. London, New York, New Rochelle, Melbourne, and Sydney: Cambridge University Press. ISBN 0-521-23746-7 (cloth); ISBN 0-521-28199-7 (pbk). Lawson, Rex. 1986. Stravinsky and the Pianola, in Confronting Stravinsky, edited by Jann Pasler. Los Angeles: University of California Press. ISBN 0-520-05403-2. Palmer, Tony. 1982. Stravinsky: Once at a Border.... (TV documentary film). [UK]: Isolde Films. Issued on DVD, [N.p. ]: Kultur Video, 2008. Simeone, Lisa, with Robert Craft and Philip Glass. 1999. "Igor Stravinsky" NPR's Performance Today: Milestones of the Millennium (16 April). Washington, DC: National Public Radio. Archive (edited) at NPR Online. Slim, H. Colin. 2006. "Stravinsky's Four Star-Spangled Banners and His 1941 Christmas Card". The Musical Quarterly 89, nos. 2 and 3 ([northern] Summer–Fall): 321–447. 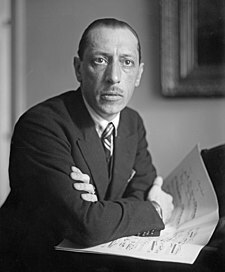 Stravinsky, Igor. 1962. An Autobiography. New York: W. W. Norton & Company. ISBN 0-393-00161-X; OCLC,311867794}. Originally published in French as Chroniques de ma vie, 2 vols. (Paris: Denoël et Steele, 1935), subsequently translated (anonymously) as Chronicle of My Life. London: Gollancz, 1936. OCLC 1354065. This edition reprinted as Igor Stravinsky An Autobiography, with a preface by Eric Walter White (London: Calder and Boyars, 1975) ISBN 0-7145-1063-7 (cloth); ISBN 0-7145-1082-3 (pbk.). Reprinted again as An Autobiography (1903–1934) (London: Boyars, 1990) ISBN 0-7145-1063-7 (cased); ISBN 0-7145-1082-3 (pbk). Also published as Igor Stravinsky An Autobiography (New York: M. & J. Steuer, 1958). Taruskin, Richard, reply by Robert Craft. 1989. "'Jews and Geniuses': An Exchange". New York Review of Books (15 June). Walsh, Stephen. 2001. "Stravinsky, Igor." New Grove Dictionary of Music and Musicians, second edition, edited by Stanley Sadie and John Tyrrell. London: MacMillan Publishers. Zappa, Frank, and Peter Occhiogrosso. 1989. The Real Frank Zappa Book. New York: Poseidon Press. ISBN 0-671-63870-X (reprinted twice in 1990, New York: Fireside Books, ISBN 0-671-70572-5 and New York: Picador Books ISBN 0-330-31625-7). Joseph, Charles M. 2001. Stravinsky Inside Out. New Haven and London: Yale University Press. ISBN 0-300-07537-5. Kohl, Jerome. 1979–80. "Exposition in Stravinsky's Orchestral Variations". Perspectives of New Music 18, nos. 1 and 2 (Fall-Winter/Spring Summer): 391–405. doi:10.2307/832991 Vorlog:Jstor (subscription access). van den Toorn, Pieter C. 1987. "Stravinsky and The Rite of Spring"
Jews and Geniuses On Stravinsky being a Jew or not and about his antisemitism. See also another response and the original media review by Robert Craft. Portrait of Igor Stravinsky conducting – A series of images from the UBC Library Digital Collections depicting the composer rehearsing with the New York Philharmonic. An archive recording of a radio program by William Malloch@1@2Vorlage:Toter Link/www.archive.org (Seite nicht mehr abrufbar; Suche in Webarchiven) that includes a discussion of how attitudes toward Stravinsky’s music changed through the years. Included are excepts from the The Firebird, Petrouchka and The Rite of Spring recorded from the 1930s to the 1950s by a variety of conductors, including the composer himself. De Seitn is zletzt am 21. Dezemba 2017 um 19:06 gändert worn.